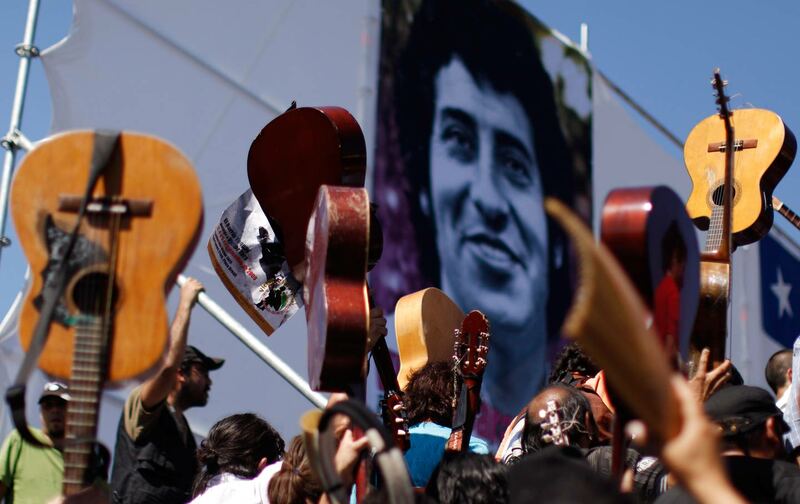 The killer of legendary folk singer Victor Jara has been found guilty in Florida. The Justice Department should now extradite him to Chile. On June 13, just one day after the horrific massacre at the Pulse nightclub, legal proceedings began in Orlando, Florida, in a unique case of another major atrocity, committed far away and over four decades ago: the execution of the Chilean folksinger Victor Jara following the September 11, 1973, military coup in Chile. After two weeks of dramatic and painful testimony presented by Jara’s family, other victims, and former soldiers in a civil case in federal district court, a jury has found a former Chilean lieutenant, Pedro Pablo Barrientos Nuñez, liable for the torture and murder of Jara. Barrientos was ordered to pay the Jara family $28 million in punitive and compensatory damages. The stunning verdict is generating headlines around the world—particularly in Chile, where Barrientos has already been indicted in absentia for killing Jara. The outcome of the US trial marks another historic milestone in tenacious legal efforts—including ones outside Chile—to hold officials of Gen. Augusto Pinochet’s regime accountable for human rights crimes that date back to the first days after the coup. Indeed, the Jara case brings renewed attention to the presence of Chilean human rights criminals living in the United States, and renewed pressure on the Obama administration to expel Barrientos to Chile where he can be formally prosecuted in criminal court, judged, and sentenced. At the time of his murder, Victor Jara was Chile’s leading political troubadour, universally recognized for such folk songs as “Te Recuerdo Amanda” and “Plegaria a un Labrador.” His signature song, “Manifesto,” became a veritable anthem of the socialist government of Salvador Allende. I don’t sing for the love of singing, or because I have a good voice. I sing because my guitar has both feeling and reason. It has a heart of earth, state his lyrics. My guitar is not for the rich, no, nothing like that. My song is of the ladder we are building to reach the stars. For a song has meaning when it beats in the veins of a man who will die singing, truthfully singing his songs. Bruce Springsteen has called Jara “a great inspiration” and paid tribute to him by singing “Manifesto” during a concert in Santiago several years ago. On the day of the coup, Jara left his family and went to the State Technical University, where he worked as a theater professor, to help defend the campus against a military seizure. He and several hundred students were detained the following day; Jara was taken to the Chile stadium, which the military had quickly transformed into a massive detention and death facility. In 1978, Jara’s widow, Joan, first attempted to pursue charges against the military but was blocked by the Pinochet regime’s impenetrable cover-up of its human-rights atrocities. Even after the return of civilian rule in Chile in 1990, legal efforts to identify and prosecute Jara’s killers failed to gain traction. Only in 2012, several years after several soldiers who had participated in the massive atrocities at the Chile stadium broke their silence and identified Barrientos as the executioner, did the case move forward in Chile. In December of 2012, a Chilean judge indicted Barrientos and seven other officers for the murder of Jara; a total of ten are now on trial. By then, however, Barrientos had long departed Chile. In 1989, as Pinochet’s dictatorship was drawing to a close due to the massive movement for democracy, Barrientos relocated to Deltona, Florida—seemingly out of reach of Chile’s post-military judicial system. After misrepresenting his involvement in the bloody military coup on his naturalization application, Barrientos became a US citizen. Although Chile formally requested his extradition, to date the US Justice Department has refused to initiate expulsion proceedings, demanding a high standard of proof because of his citizenship status. The verdict strengthens the hand of Chile’s government, which is pressing for the return of other Chilean military officials. Indeed, the verdict strengthens the hand of Chilean President Michelle Bachelet, as her government continues to press the Obama administration to return Barrientos—and other Chilean military officials who have sought refuge in the United States. As the first legal ruling of guilt and liability in the Jara case, says Chilean journalist Monica Gonzalez, who testified in Florida on her own investigation into Jara’s murder, “the suit sets an important precedent” for a future criminal trial in Santiago. The National Security Archive in Washington, DC, provided declassified US records on abuses committed in the Chile stadium for use in the Jara suit. Adeline Hite provided research assistance for this article.